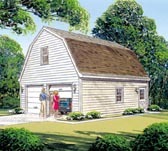 Question: What is the height and the width of the garage doors? 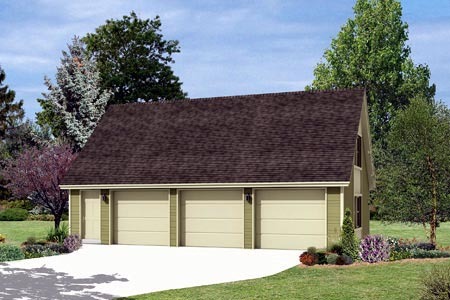 What is the ceiling height of the garage? ARe there any posts in the garage floor area?can this be designed with the mandoor on the side? Can dormers be added to the roof ot the front? Answer: The garage doors are 9’x7’ and it has an 8’ ceiling height. There are three columns in the garage, one on the far left of the plan in the wall next to the stairs, and the other two are centered in the garage between the doors. It is possible to move the man door and add dormers, both simple modifications with a reproducible or CAD. Question: Does the 7'-0" Loft center height extend across the entire 826 sq ft area of the loft? If not, please show the area where at least 6'-0" Loft height is maintained. Answer: The ceiling height is actually 7’-6”. It is flat for approximately 6’-6” of the 24’ width then it starts sloping all the way to the floor. You have a clear head room of 6’ for about a 9’-6” width of the loft. I hope this helps. Let me know if you need anything else. Thanks. Loft is approx. 826 sq.ft. It is open across the entire building, 24'-0". The height in the center 7'-0".